Printing An Austin original since 1920, Miller IDS is preferred among architects, engineers, and contractors who need top quality color or black & white prints. We have immense experience in this industry and are dedicated to producing the highest caliber product with amazingly fast turnaround times. Miller IDS proudly features HP PageWide 8000 XL printers in our CIM/Reprographics production department. 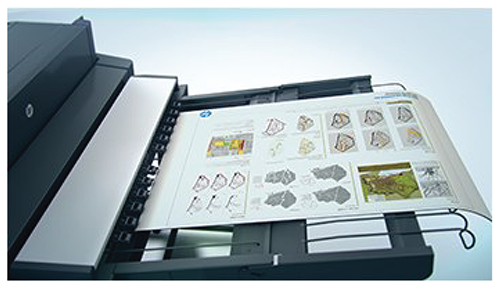 At thirty 24×36 drawings per minute the HP PageWide 8000 XL is the fastest large format printer in the world. This incredible speed beneﬁts customers who need their time critical prints now rather than later. Customers are also beneﬁting from the lowest prices ever on their color CAD prints due to the extremely low cost of ownership. The diﬀerence between monochrome and color CAD prints is only a dime per square foot. Watch our team produce a 22ft TDOT print in mere seconds here!